I have a 2000 time trial tomorrow morning. Gulp. Last week I nearly killed myself with the 4x1000 workout. Monday I did 6x3:00 intervals on the grass with HR maxing out at 171, 179, 179, 182, 186, and 188. Its a nice looking chart, I'll have to post it. Tonight I hit the track for 6x400. Looking in my logs for the last two years, I had been running these around 73-75. Coach Vaughan suggested 72 or better. I just can't seem to satisfy this man! Now at this point Coach Vaughan asked me if I wanted to stop, to which I replied "Hell No". Anyway we will put this one in the bank as a success. It is less than three weeks until the first TRACK MEET! YIKES! I can't believe the weekend is over, probably because I am completely worn out. Friday, I stayed at work until very late. I had an RFQ that I have been working on for weeks. Thankfully, I got that out the door. Unfortunately I got home after midnight and was up at 6:30 to run with McGehee. Saturday morning was nice and cool, but there was a strong west wind. McGehee and I hammered his 12 mile loop and McGehee didn't even have to go to the hospital. This was the last long run of the season. From now until the end of July it will be Saturday Morning on the track at SMU. I got home, had some very nice Community Coffee with Chicory, which my Dad had sent me for my birthday. We then headed to Joe's Crab Shack to meet Fran, her parents, her buddy KB, KB's daughter (who’s birthday is the day before mine,) and KB's Grandson. At Joe's I ran into a former Micrografx coworker of mine, coincidentally named Joe. Then I headed to the rent house. Two couples came by to see it. Plus I mowed, spread some fertilizer, and watered the lawn. I hurried home, because Fran and I were going down to meet another former Micrografx colleague for dinner. But first we had to pack up the kids and drop them over at KB’s house. KB also asked me to fix her DVD player, as her grandson had flipped the progressive scan switch on the back of the unit which rendered it useless in playing DVD's on her TV. Of course it took me a while to debug and fix that problem. Paolo had flown in from Italy, for a visit. We met him for dinner at Arcodoro Pomodoro a phenomenal Sicilian restaurant here in Dallas. I had a wonderful Linguini with Clams. Superb. Post dinner we had a few cocktails at the Hardrock then it was back to KB's to pick up the kids and get them in bed. That was an exhausting Saturday. Sunday, Marissa was up early, as she had a game in Southlake, which her team won. Fran left me on my own to deal with Reagan and Logan. Both got up late. Logan had a game at 1:30. We hung out and took easy until then. It was tough, but I did finally manage to get them both dressed, get their hair up and get them out the door to the game. Logan's team played to a 2-2 tie, with goals by Amanda and Natalie. Logan played defense in the first half superbly. She also played an inspired final 10 minutes at mid. Meanwhile Reagan had conned Amanda's older sister to buy her a bunch of junk out of the vending machines at the soccer complex. I had snack duty for the game, so I had hauled all the team snacks in there, and what was left out of there too. While at dinner on Saturday, Laci had called about seeing the rent house on Sunday. I had called her back and offered to show it to her after the game, but she never returned my call. Sheesh! So Logan, Reagan and I headed back home. Fran and Marissa had come and went. Dang. I needed to get my run in. So I plopped Reagan in the stroller, and Logan on her bike and we all headed to the park. I managed to get five miles in capping off a 49.5 mile week. Yea! Logan was really tired from her game and doing five more miles on the bike was really pushing it for a 6 year old. But she did great. So that was the weekend. There was so much that did not get done: Change the oil in both trucks, fix our shower which has some cracked grout, shampoo the carpet in the rent house. You get the idea. But frankly there is no time! I need to work on this one. Sam Houston defeats Santa Ana at San Jacinto. The San Jacinto Liberty Flag to the left. Musical Legend Iggy Pop is born. The Red Baron was shot down and killed. Pope Alexander II kicked the bucket along with Mark Twain. I'm just back from the SMU track. The plan was for 4x1000 at faster than 5K pace but slower than 1500 pace. According to Coach Vaughan that worked out to an 81-82 pace per lap with five minutes rest. There was a big south wind which I had to my back from 100-300 but in my face big time on return. Now that’s a nice set! I took my spikes off for the next two and went with the flats. OK now fatigue was setting in. Last one coming up. As coach says, "anyone can do one more." 40.1 Well, right then I started to feel a twinge in one calf then the other, as I was coming around the 300 my right calf started to cramp. I had to slow and then of course it was clear that I needed to stop. Imagine if you will, 40,000 nut jobs all packed into the very teeny, weeny town of Hopkinton, Mass. It was the start of the 100th running of the Boston Marathon. I had qualified in the Men’s Open Division with a time of 2 hours and 56 minutes at the 94 Dallas White Rock Marathon. My training for the event had been excellent. However, I came down with a cold 9 days before the race. I felt particularly bad the weekend before the race. I remember having no energy at all during the expo. The morning of the race, I felt better. It was an amazing scene in Hopkinton. Before the race, I hung out at the Texas House and then just before noon, I climbed into the fourth coral. It took me a minute to get to the starting line. My first mile was 7:25, which was not bad given the number of people and the downhill start. I was actually feeling very good. My cold had broken. Miles 2-13 were between 6:26 and 6:48. My time at the half was a respectable and somewhat conservative 88:12. At that point fatigue was starting to kick in. Miles 14-18 were 7:01 - 7:25. At 18, in the middle of the Newton Hills I heard nature calling, and pulled off the course. I posted a 10:01 for that mile. I was ok for the next two miles at 7;39 and 7:51 but at mile 21 I was done - toast. I walk-jogged in from there with miles inbetween 10:17 and 12:28. The second half was run in a disappointing 2:00:17. Given the enormity of the event, there was no way I was NOT going to run it - so given my cold I have to be pleased with the result. Boston 96 was my 13th and LAST marathon! Before I go into today's game, allow me to bring y'all up to speed on the soccer front. Two weeks ago Logan's team played their arch rival team, Force Academy. It was a horrific game from our point of view. We got shutout seven goals to none. Last week they played the Celtics and the team played much, much better in a losing effort: 4 goals to 2. In goal Logan gave up one goal against the Celtics and two goals against Force. On the field Logan had some moments of brilliance. Against the Celtics Logan was playing defender, when one of her team mates passed the ball across the defensive side of the field. No players from either team were anywhere nearby. Starting from the goal, Logan beat a Celtic player in running down the ball and keeping it in play. Then she beat that Celtic player again, and drove the ball all the way to the front of their goal! Before today's game, we got word that Natalie was sick and would not be able to play. Natalie is the leading scorer on the team this season. I pointed out to Logan, that other players like her would need to kick it up a notch to replace Natalie. Logan told me that there was no way that she could do what Natalie does, that she would NEVER score a goal, Blah, Blah, Blah, Yada, Yada, Yada. Marissa pointed out that when Cheyenne left the Red Hots that Cheyenne was the leading scorer on that team and that Marissa had never scored before Cheyenne left. She told Logan how she stepped in and became the leading scorer for the Red Hots that season. Of course Logan just rolled her eyes at both of us. However, when we got to the field to play the Blue Lightning Logan ran over to Coach Don and told him that she was going to fill in for Natalie today! The Lightning was unable to field a team, so they forfeited the game and we scrimmaged against them instead. On the field Logan was all over the place. Coach Don had to keep reminding her where she should be playing. Then on one play in the third quarter, Morgan drove the ball right in front of the goal. Logan was finally in the correct position on the wing. Morgan passed the ball to Logan and Logan fired the shot for the goal! Logan played the last quarter in goal and allowed nothing to get by her. A very interesting day for Miss Logan! And in other developments, she has an indoor game tomorrow and then her final outdoor game of the season on Monday. I finished my income tax return last night. This item has been causing me stress for the last several weeks. I skipped two runs this week due to scrambling to get the taxes done. Nothing makes me grouchier than taxes. If you don't believe me, just ask my wife and kids. Not surprisingly, there are some interesting commentaries around taxes that have been cropping up this week. This blog entry about NFL Players would be funny if it didn't highlight just how out of touch many tax payers are about taxes and their impact on peoples lives and the economy. On a more serious tone, the Washington Times had a very interesting report on the legislation passed by the House to end the estate tax. They quote Nancy Pelosi as saying, "What Republicans are doing today is putting their hand into that pot [social security] and saying, 'We're taking that money and we're subsidizing the super wealthy.'" I find her comment bizarre on many levels. The most fundamental objection that I have is the notion that individuals don't own their property. She seems to be suggesting that ANY estate is the property of the Government (or The People, I suppose). And that the act of leaving the estate to its owners is taking that property away from the Government/People and 'subsidizing' those who rightfully own that property. There is clearly a need for taxation in order to fund the necessary vehicles of the government. It is just plain irresponsible for a leader in the House of Representatives to suggest that private property belongs to the people. No wonder sending in my taxes every year makes me so cranky. Speaking of native residents of The Hughes Bungalow, the Anole lizards have come out of hibernation. Marissa LOVES Anole Lizards. At any given time she usually has 10 or more of them captured. Every couple of days I free them. It does not take Marissa much time to get them all rounded up again. The photo below is Marissa with 'Sparky'. Sparky was living behind the electrical service box. Sparky also hops like a frog. Marissa is pretty much an expert on the behavior of the Anole Lizard. She tells me that she has NEVER seen one that hops instead of runs. Her theory is that Sparky got zapped in the electrical service. Logan has never demonstrated a passion for Lizards. Reagan Kelley however seems ready to follow in Marissa's footsteps in this department. This is Reagan holding a baby lizard that Marissa caught. Notice Logan is holding Reagan's hand - not the lizard! As some of you may know, I occasionally dabble in real-estate. Friday Fran bought me a new apartment complex as an early birthday present! It's an interesting arrangement in that the tenants will not pay rent. Instead they are obligated to work around the house, primarily in the pest control area. In spite of their indentured servitude, they are a happy lot and tend to break out in song with little warning or notice like Snow White's Dwarves. 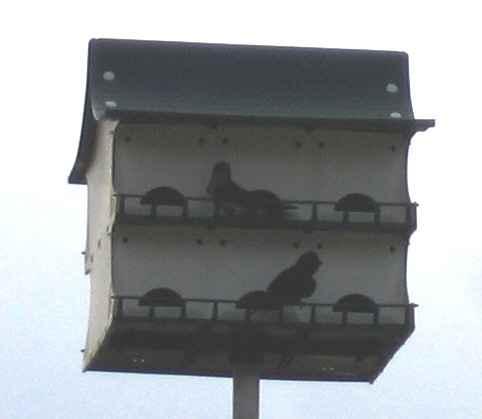 By now, I hope that you have guessed that my present was a Martin House, home to the notorious Purple Martin. Yesterday I dug a hole in the back yard and then cemented in an anchor for the pole. Today I hoisted the house up on the pole. Within an hour the Martins had taken over! Amazing! Photo Left. The Martins are actually taking over for the Mosquito Magnet that we purchased a couple of years ago. The Mosquito Magnet is really a wonderful machine. It kills Mosquitoes and only Mosquitoes. But it is hideously ugly (right), a bit noisy, it requires monthly trips to the store to change out the propane tanks, it requires electricity as such it is tethered to a long cord which is always in the way, and it does not break out in song. We do have one resident who is not pleased about the addition of the apartment complex. Stompy the cat (left) has made it known that birds in general are not to be encouraged or tolerated in any way shape or form. 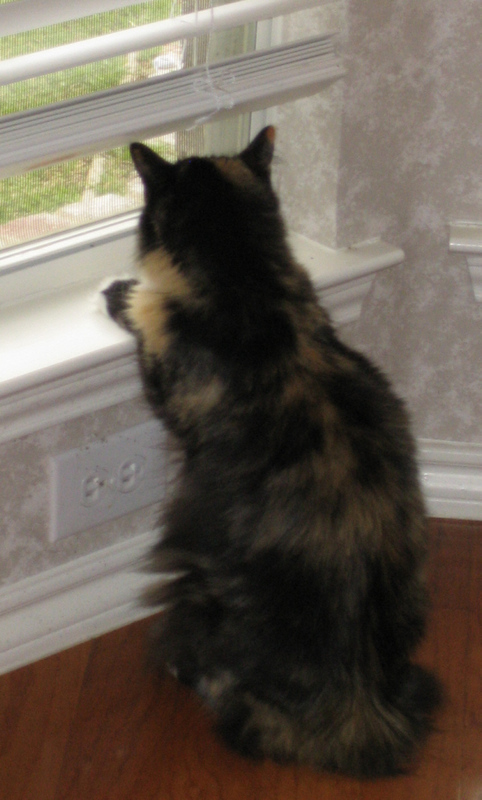 Here she is keeping an eye on the evil birds. Yesterday she got so mad at the birds that she tried to jump through this very same closed window! Update May 20-2007 - Fixed some of the photos. As I mentioned earlier this week, my trusty old ViewSonic 19" Flat screen CRT bit the big one. So today I went down to Fry's and pulled the trigger on the Samsung Flat Panel Display. I have had it running for all of 20 minutes as I tap out this note. PC Magazine rated this model very highly. The cats down at Fry's told me that this is one of the best selling models in the store. It certainly is extremely sharp and the display is HUGE, yet this thing is so small compared to my old tube. And it does not throw off any heat either. Five Stars, Joe Bob says check it out! Sep 17, 06 - Fixed broken Image Link. Mar 21, 08 - Fixed broken Image Link. Jan 11, 09 - Removed stupid Image Link! Tags: Texflats Samsung SyncMaster 213T Yuh! A classical approach to Software Development requires that the product pass through several gates or hurdles on its way to being certified for general consumption. Our project passed through one of those gates today. Our friends in the Quality Assurance Team have blessed the software as "Beta 2" ready. This effort has consumed a considerable amount of my energy over the last two weeks. We have several more gates to go before we can SHIP IT! But until then, I can take a few moments to regain my bearings. As noted yesterday, a very nasty thunderstorm rolled through Dallas dropping golf ball sized hail at the homestead. Two years ago we had a similar storm which destroyed our roof, fence, trees, and pretty much everything else around the house. That storm dropped golf balls for 30 minutes or more. Yesterday's version was not nearly as bad. My neighbor’s fence fell down. Lots of leaves were ripped from the trees. But not much other noticeable damage beyond that. Golf ball size hail at the Hughes Bungalo. We just got a new roof two years ago for this same thing. It seems like the motto for my day today is, "Hurry up and wait". I fired up the build machine this morning so that I could get a fresh build of our project that included last night’s updates from my team in Pune, India. After the build finished, Build Automation Guy told me that he had been working on some changes with our database developers and that the build would probably not install correctly. So we started the build machine again. The next build failed to compile. So we got that fixed and now I am waiting on the next build to compile. Recently I updated my testing machine too. I added a faster drive, installed VMware Workstation 5 (in Beta), and started using Windows 2003 Server with Oracle as my primary test environment. Well it appears that VMware hosting Windows 2003 Server is about the slowest thing known to mankind. Between these two issues, it feels like I am swimming in molasses! What a pair of exciting games!!! The first thing that I noticed when I got inside the stadium was a preponderance of ORANGE. It had not occurred to me before that time that the University of Illinois is a relatively short distance from St Louis. Louisville didn't stand a chance with regard to fan support. It simply was not fair. It was also apparent that the Michigan State section was lacking an appropriate number of supporters. But wait, after the first game half the stadium switch colors from orange to green. IT WAS A BIG TEN conspiracy!! For the second game we improved our seats dramatically. We were surrounded by Illini fans most of whom showed us both their green and orange shirts. They explained that before the game there was a plan put together to support both teams. They pointed out that the Illini band played the Michigan State fight song during the first game. Well, as you know, Michigan State needed all the help that they could get. The Illini support may have helped during the first half of the Carolina game where both the team and the Carolina fans were sleeping. But nothing could overcome Coach Williams hysterics in terms of getting the Carolina players fired up. The scene in downtown St Louis post game was amazing. Everyone was well behaved. The streets were flooded with Illini fans dressed in Orange. It was a great party. On my flight home I sat across the aisle from Gil Brandt and his son, who was wearing a Carolina hat. I asked Gil about what he thought about Carolina and Coach Williams. His replied with a question, "wasn't this the same team that only scored 8 wins?" Gil knows a bit more about sports than simply football!! The semi finals are tomorrow and I need to figure out which side of these games I should come down on since I will be sitting up in the rafters of the Dome. I like Carolina both as a fan of the ACC and also I have thought for a while that they are clearly the strongest team in the field. I am amazed at what Williams has done with the program. But, you gotta give the Big 10 credit with getting two teams to the final four. MSU has looked pretty good in their NCAA games. Illinois showed guts and determination in overcoming that 16 deficit last week against 'zona. I have not watched much if any of Louisville - so I think I have to land on the side of Illinois in that game. No matter what it should be an exciting pair of games!! I am looking forward to being there.